Found along the warmer Bushveld and Lowveld river-areas, especially the northern and eastern borderlines of the Northern Province and Mpumalanga, as well as in a large part of the northeastern KwaZulu-Natal area. Although a newborn crocodile only weighs about 90 grams, and measures only 25 - 30 cm (12 inches), feeding on insects, it may reach an enormous length, weight and age, and then even feeds (although very rarely) on giraffe, buffalo and yes, lion! Crocodiles are believed to reach up to 100 years of age! Of course, the crocodile won't in general take on these above-mentioned animals. Rather, a medium-sized antelope would normally serve as its prey every two to three weeks. 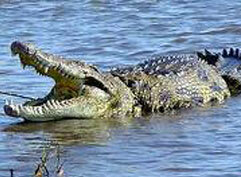 The crocodile will almost certainly be seen near a river or riverbed, although they migrate on land if a river runs dry. It is a myth that the crocodile prefers rotten meat above fresh meat. It always swallows its food above the surface. It will ambush an unsuspected animal while the latter is drinking water. By drifting nearer almost without notice (on the eyes and sometimes the nose may be above the water) it will come very close to the prey. It can keep its nose under water for up to 15 minutes. Then, like lightning, it will struck by grabbing the nose or foot of the victim. It directly returns to the water, where the strong tail will keep the crocodile swimming while the poor victim won't have any defense left. But be aware: crocodiles do catch its prey sometimes at land as well! It can't run far at high speeds, but is incredibly fast over a very short distance. It's enemies is the hippo, who will definitely defeat the crocodile. Elephants sometimes also kill a crocodile. Be on the alert for this brute with it's cat-like yellow-green eyes and its deadly teeth: all 75 odd ones of them!